Product prices and availability are accurate as of 2019-04-23 06:11:24 UTC and are subject to change. Any price and availability information displayed on http://www.amazon.com/ at the time of purchase will apply to the purchase of this product. 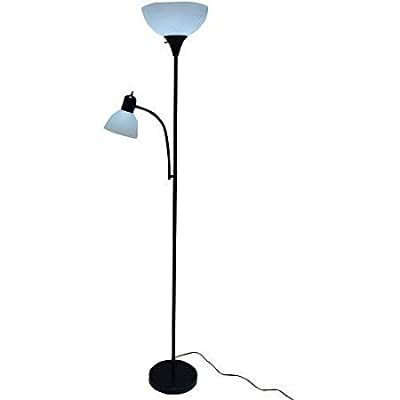 The Mainstays combination floor lamp is two lamps in one, featuring a 100-watt main lamp with an additional 60-watt reading lamp (light bulbs not included). This sturdy yet slim 72" black plastic lamp includes an attached reading lamp with an adjustable gooseneck, two white frosted shades for a subtle ambient effect, and a 9" diameter plastic base. The main top light is controlled by a 3-way rotary switch and a simple on/off switch for the bonus reading lamp. The sleek and modern design makes this lamp a perfect addition to any living room, bedroom, or home office and a must-have for college living spaces.